What if you were following a plan for your money that you KNEW worked? With Dave Ramsey’s Financial Peace University, you CAN take control of your money, get out of debt, and create a plan for your future. If you’re interested in learning more, please contact us! 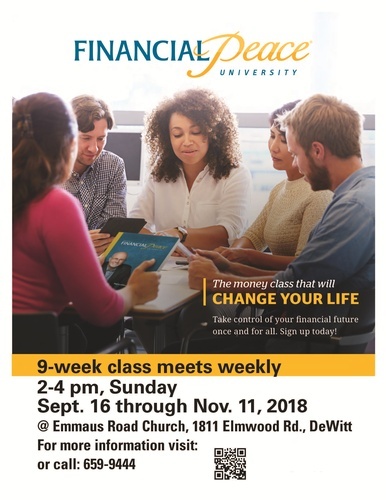 We’re hosting this life-changing class at Emmaus Road Church just for you starting 9-16-18. Class meets weekly from 2-4 pm on Sunday afternoons beginning Sun, Sept. 16th. Registration will remain open through 9/28/18. Luke & Lauren Frobish (FPU Class Coordinators @ Emmaus Road Church). One-time registration fee for class membership & materials applies ($109.00 with early group discount). Membership extends to immediate family members within the same household.